Tata has finally revealed the Harrier`s production version. It looks quite identical to the H5X Concept that was showcased at the 2018 Auto Expo. The production spec images reveal that the Harrier will get projector headlamps at the front which are sleek and modern and LED taillamps at the rear. Tata Motors has opened bookings for the Harrier for an amount of Rs. 30,000. Customers can book the Harrier either online or by visiting an authorized Tata dealership. Firstly, the Tata Harrier is the first flagship SUV from the brand`s stable. Secondly, the Harrier is based on Tata`s 2.0 IMPACT design language. Also, all future Tata cars will feature the new 2.0 design philosophy. Thirdly, the SUV is built on the Omega Architecture platform which is derived from the Jaguar Land Rover`s D8 architecture. As a result, it is a monocoque platform and offers exceptional torsional rigidity. Apart from this, the SUV offers the best driving dynamics in both off-road and urban conditions. Prices for the Tata Harrier are expected to start from Rs. 13 lakhs onward. Under the hood, the Harrier is powered by a 2.0 litre, 4-cylinder Kryotec diesel engine. The diesel engine is a derivative of the Fiat Multijet 2.0 unit. It also gets multi-drive modes. The motor develops 140 PS of power and 350 Nm of torque. Power is sent to the front wheels, via a 6-speed manual gearbox. The Kryotec engine features an advanced EGR system to ensure it meets stringent emission norms. Moreover, the engine gets a (eVGT) electric variable geometry turbocharger. Tata is working on a seven-seat version of the SUV, and it will be launched at a later date. Because, it is based on the Land Rover`s D8 architecture, the Harrier offers class leading legroom and headroom. However, there is no word yet about a petrol engine or a 4×4 variant at the moment. The Harrier delivers an ARAI certified fuel economy of 16.7 kmpl. The mileage also depends on the driving modes being used Eco, City, or Sport mode and the driving conditions. To sum up, the Tata Harrier is by far the best product from Tata Motors. It directly rivals the likes of the Jeep Compass, XUV500 and Hyundai Creta. Tata Harrier – Frequently Asked Questions? 1. What type of engine options are available with the Tata Harrier? 2. 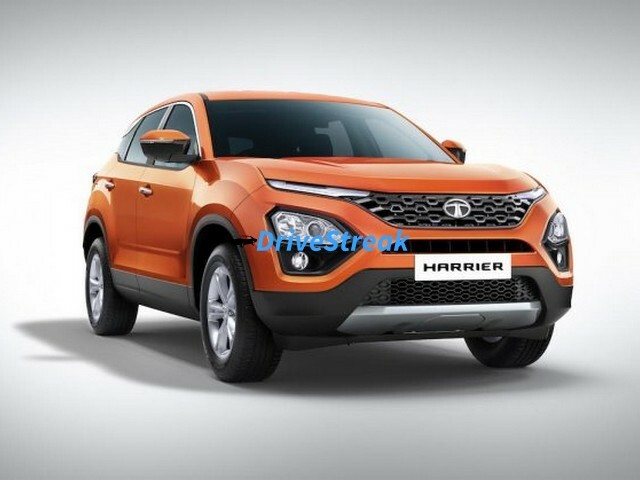 How to book Tata Harrier? The Tata Harrier can be booked online or through any Tata dealership In India for an amount of Rs. 30,000. 3. What is the price of the Tata Harrier? This SUV from Tata Motors is priced from Rs.12.69 lakhs to Rs. 16.25 lakhs ex-showroom, Delhi. 4. Will the Tata Harrier get a sunroof? The Harrier does not get a sunroof which is a big let down as its arch rival Hyundai Creta is offered with a sunroof. 5. Will it get an automatic transmission? The Harrier has been launched with only a manual transmission. An automatic variant is in the pipeline but it will not be launched anytime soon. 6. Is Tata Harrier BSVI compliant? The 2.0 litre diesel engine powering the SUV is BS IV compliant. 6. What is the boot space on offer and how many passengers can it seat? It is a 5 seater and can seat 5 passengers in comfort. Since it is based on the Land Rover Discovery Sport platform, it offers loads of legroom for the front and rear passengers. It has a boot capacity of 425 litres, which can be increases to 810 litres by folding the rear seats. 7. When will Tata launch the Harrier? Tata has launched the Harrier in India on Januray 23rd, 2019. 8. Will it get a 4X4 version? The company has confirmed that it has no plans of bringing in a 4X4 version of the SUV in the future. 9. What is the fuel tank capacity of the Harrier? How does it perform? This new SUV from Tata has a fuel tank capacity of 50 litres. It delivers a mileage of 16 Kmpl on the highway and 14 kmpl in city conditions. 10. Is Tata Harrier an electric SUV? It is not an electric SUV. It is powered by a diesel engine mated to a manual transmission. 11. Is the Harrier worth buying? Taking into account the value for money pricing and the features it has on offer, the Harrier is definitely worth buying. It gets different driving modes, six airbags, and a long equipment list and safety features.